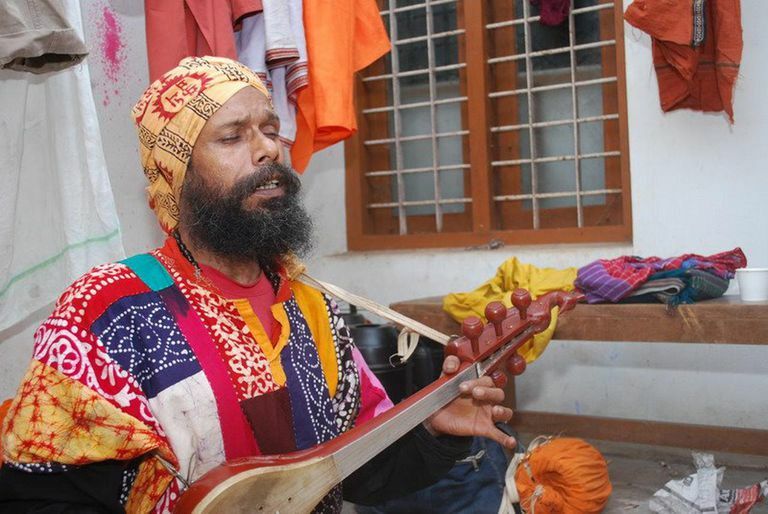 The mystical Baul music cult is not just unique to Bengal, but also has a special place in the history of world music. The word "Baul" has its etymological origin in the Sanskrit words "Vatula" (madcap), or "Vyakula" (restless), and is often used to describe someone who is "possessed" or "crazy." Originally, the Bauls were simply nonconformists who rejected the traditional social norms to form a distinct sect that upheld music as their religion. "Baul" is also the name given to the genre of folk music developed by this creative cult. It's easy to identify a Baul singer from his uncut, often coiled hair, saffron robe (alkhalla), a necklace of beads made of basil (tulsi) stems, and of course, the single-stringed guitar (ektara). Music is their only source of sustenance: Bauls live on whatever they are offered by villagers in return, as they travel from place to place, riding, in effect, on the vehicle of their own ecstasy. Individuals consist mainly of Vaishnava Hindus and Sufi Muslims. They can often be identified by their distinctive clothes and musical instruments. Not much is known of their origin, though it is conjectured that the cult of traveling musicians may date back to the 9th century CE. Not until the mid 18th century are they noted by historians as a major, identifiable cult. Bauls croon from their hearts and pour out their feelings and emotions in their songs. But they never bother to write down their songs, since theirs is essentially an oral tradition. It is said of Lalan Fakir (1774 -1890), the greatest of all Bauls, that he continued to compose and sing songs for decades without ever stopping to correct them or put them on paper. It was only after his death that people thought of collecting and compiling his rich repertoire. The lyrical themes area mostly philosophical, taking the form of allegories on the state of disconnect between the earthly soul and the spiritual world. Often, the lyrics philosophize on love and the many-splendoured bonds of the heart, subtly revealing the mystery of life, the laws of nature, the decree of destiny and the ultimate union with the divine. Bauls use a variety of indigenous musical instruments to embellish their compositions. The "ektara," a one-stringed drone instrument, is the common instrument of a Baul singer. It is the carved from the epicarp of a gourd and made of bamboo and goatskin. Other commonly used musical paraphernalia include " dotara," a multi-stringed instrument made of the wood of a jackfruit or neem tree; "dugi," a small hand-held earthen drum; leather instruments like "dhol," "khol" and "goba"; chime tools like "ghungur," "nupur," small cymbals called "kartal" and "mandira,"and the bamboo flute. Originally, the district of Birbhum in West Bengal was the seat of all Baul activity. Later, the Baul domain stretched to Tripura in the north, Bangladesh in the east, and parts of Bihar and Orissa in the west and south respectively. In Bangladesh, the districts of Chittagong, Sylhet, Mymensingh, and Tangyl are famous for Bauls. Bauls from far off places come to participate in the Kenduli Mela and the Pous Mela--the two most important fairs held in West Bengal for Baul music. The tradition is so integral to Bengal that it's hard to think of Bengali culture sans the Bauls. They're not only an intrinsic part of Bengal's music, they're in the mud and air of this land and in the mind and blood of its people. The spirit of the Bauls is the spirit of Bengal-- ever-flowing in its society and culture, literature and art, religion, and spirituality. "One day I chanced to hear a song from a beggar belonging to the Baul sect of Bengal...What struck me in this simple song was a religious expression that was neither grossly concrete, full of crude details, nor metaphysical in its rarefied transcendentalism. At the sametime it was alive with an emotional sincerity, it spoke of an intense yearning of the heart for the divine, which is in man and not in the temple or scriptures, in images or symbols... I sought to understand them through their songs, which is their only form of worship." Who can't trace the influence of Baul songs in Tagore's Rabindra Sangeet? The mystical nature of Tagore's lyrics is also a product of his affinity to these wandering bards. Edward Dimock Jr. in his The Place of the Hidden Moon (1966) writes: "Rabindranath Tagore put the Bauls on a higher-than-respectable level by his praise of the beauty of their songs and spirit, and by his frank and proud acknowledgement of his own poetic debt to them." The Baul pattern also inspired many other successful poets, playwrights and songwriters of the 19th and 20th centuries. Bauls are bards, composers, musicians, dancers and actors all rolled into one, and their mission is to entertain. Through their songs, pauses, gestures, and postures, these nomadic mendicants spread the message of love and ecstasy to lands far and wide. In a land devoid of mechanical entertainment, Baul singers were a major source of entertainment. Lalan Fakir is considered the greatest Baul artiste of all ages, and all other later Bauls regard him as their guru, and sing songs composed by him. 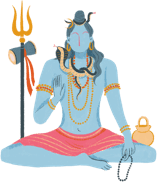 Among the contemporary Baul singers, the names of Purna Das Baul, Jatin Das Baul, Sanatan Das Baul, Anando Gopal Das Baul, Biswanath Das Baul, Paban Das Baul, and Bapi Das Baul are prominent. Purna Das Baul is undisputedly the reigning king of the Baul clan today. His father, the late Nabani Das "Khyapa", was the most famous Baul of his generation, and Tagore conferred upon him the title "Khyapa", meaning "wild". Purna Das was induced into the folds of the Baul music from his early childhood, and at the tender age of seven, his song won him a gold medal at a music conference in Jaipur. Referred to as the Baul Samrat, Purna Das Baul, introduced Baul songs to the West during an eight-month tour of the US in 1965 with stars like Bob Dylan, Joan Baez, Paul Robeson, Mick Jagger, Tina Turner, et al. Dubbed "India's Bob Dylan" by the New York Times in 1984, Purna Das Baul has played with Bob Marley, Gordon Lightfoot and Mahalia Jackson and the likes. Along with sons Krishnendu, Subhendu and Dibyendu, Purna Das Baul is planning a special tour of the US, intended to reunite an array of top stars around Baul music. Their fusion band 'Khyapa' is all set to unveil their Baul fusion at the US folk-rock-jazz-reggae fest in 2002. Then there is the grand tour of the US and Japan with concerts in New Jersey, New York City and Los Angeles. Purna Das is also hoping to rope in Mick Jagger to sing Baul gaan in Bengali on stage and on record. 'Khyapa' is also optimistic about a show with Bob Dylan, the long-time friend of Baul gaan. Earlier this year, the famous French Theatre de la Ville invited the global Baul band 'Baul Bishwa' group at its Musiques de Monde (the World Music) meet in Paris. Led by Bapi Das Baul, an eighth generation baul artiste, the group has performed at several places around the world. In this context, the collaborative effort of Paban Das Baul and the British musician Sam Mills ("Real Sugar") to produce Baul fusion music for a global audience is discernable. Did you know that Paban Das's music has also been used by Microsoft to represent the music of Bengal in its World CD-ROM Atlas? However, such efforts to globalize Baul music are being vehemently criticized by the detractors of Purna Das Baul for allegedly deracinating the Baul heritage. But don't you think this is a natural course in the evolution of Baul music - a step that needs to keep the tradition alive and kicking?